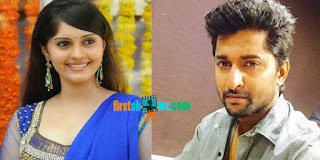 Nani’s new film in the direction of Indraganti Mohan Krishna is currently undershot, and a new schedule has commenced in Kodaikanal. Nani is pairing up with Surabhi and Niveda Thomas in this romantic thriller, which is his second combo with director Indraganti after the super hit Ashta Chemma. The untitled movie is being produced by Sivalenka Krishna Prasad, who is known for producing Aditya 369. Mani Sharma is composing the tunes. The next schedule of the movie is planned to be shot in Hyderabad, and the entire shoot will be completed by April 6. Nani who is enjoying the success of Krishnagadi Veera Prema Gaadha, is celebrating his Birthday today. Firstshowz wishes him a very Happy Birthday and many more hits for the talented Natural Star.